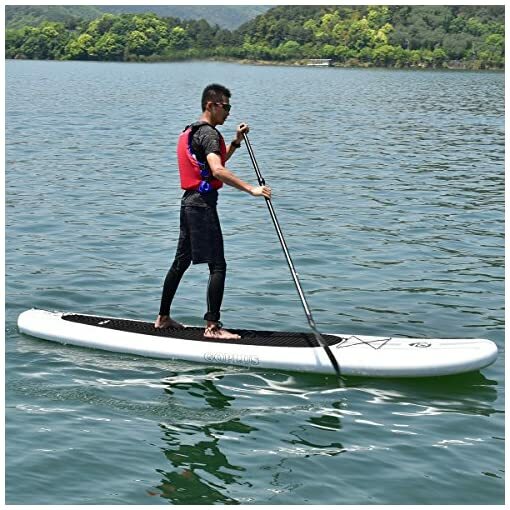 Extra Durable — It is made of high quality PVC and constructed with drop-stitch construction, which provides stability and safety for long time use. 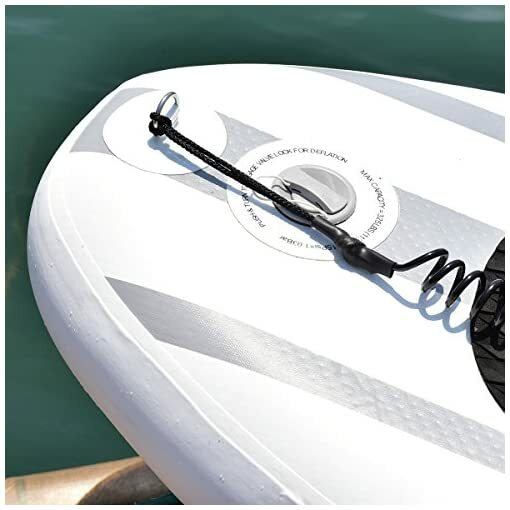 And it equipped with high quality bungee on the front deck, you can grab it to keep safe. Portable Paddle Board — Comes with a carry backpack, you can easily store and transport this board to wherever you want to go. 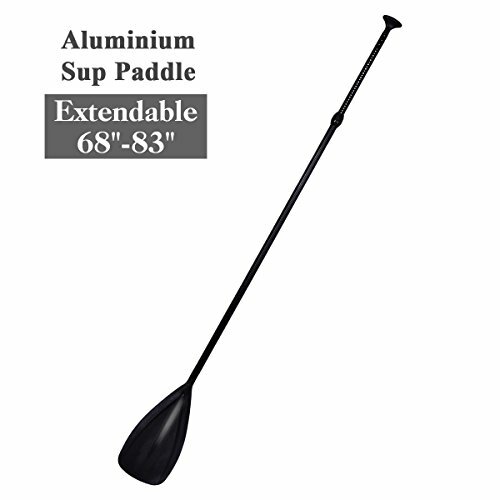 When deflated and rolled up, this paddle board is only 26 lbs. 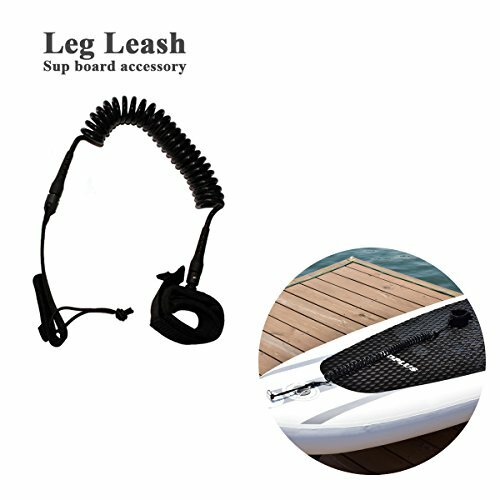 Really convenient for daily use. 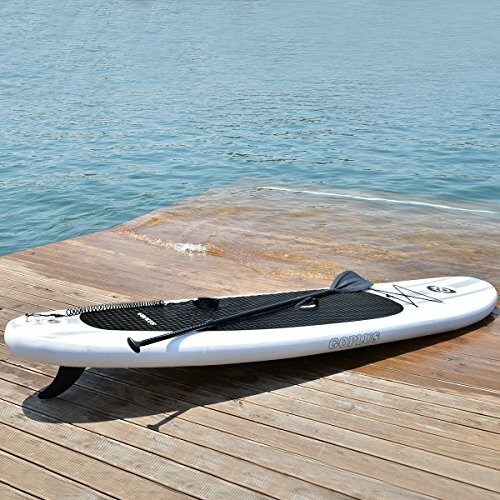 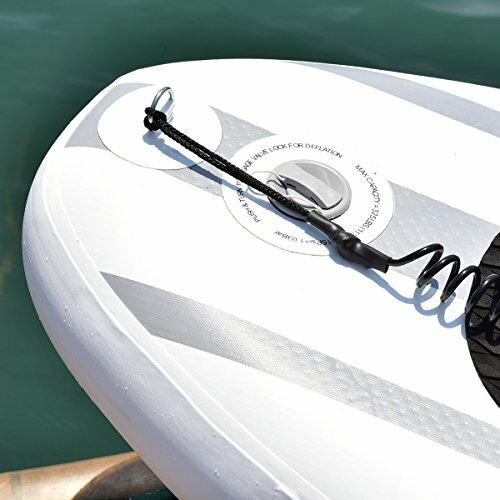 Multifunctional Use — This paddle board is perfect for all skill levels and suits in most water environments. 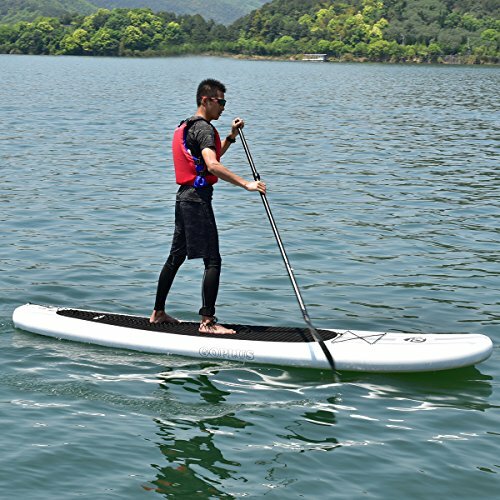 You can take a cruise through oceans, lakes or rivers. 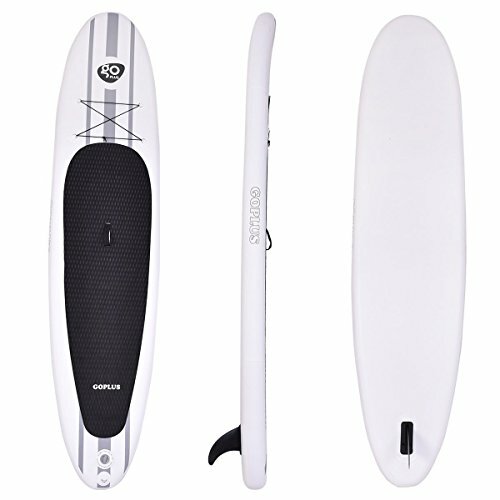 The deck pad has been extended all the way to the tail of the board for those interested in water surf, yoga, fishing. 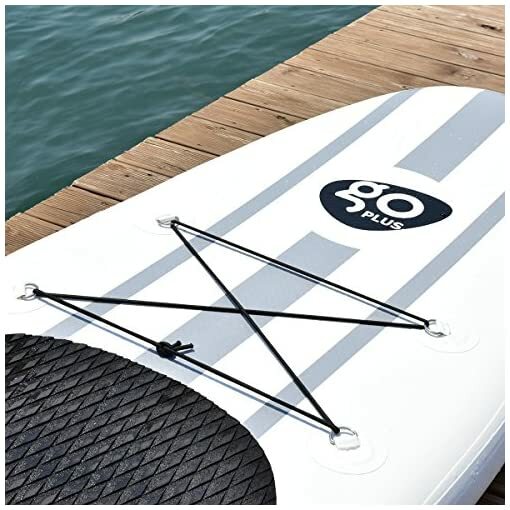 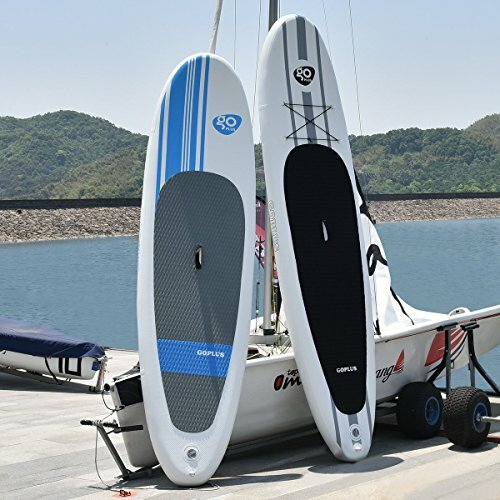 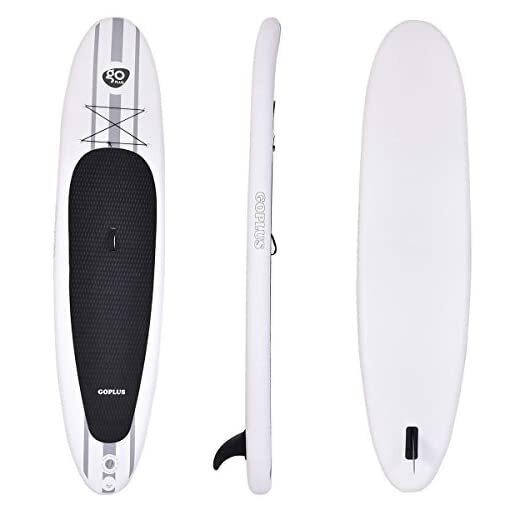 This Goplus SUP board is the most stable inflatable standup paddle board for people of all skill levels. Measures 11’x30″x6″ when inflated & is just as firm & stable as other SUPs, can be rolled up into compact package for easy transport and storage. 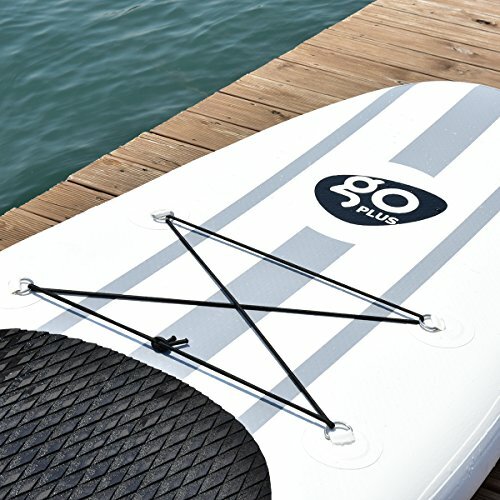 Paddle your way out onto the ocean, into a bay, or onto a lake and soak up the beauties of the natural world while inadvertently exercising your entire body (and obviously having a ton of fun). When you’re finally tuckered out, deflate your board, roll it up, wrap it up, and stuff in your trunk (imagine how many boards you can fit in an itty bitty hybrid hatchback!) and go on your merry way. 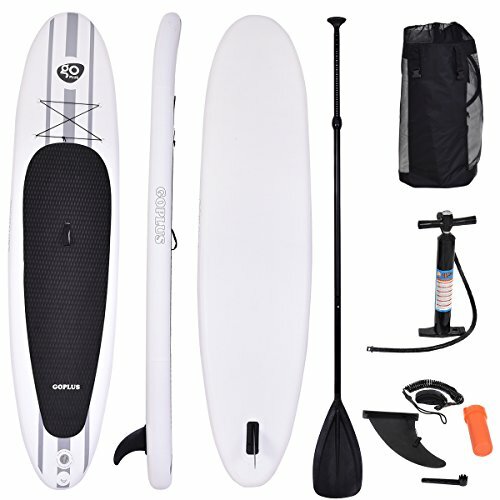 Never let the inconvenience of traveling with outdoor equipment put a hamper on your childlike senses of wonder and spontaneity. 【Weight Limit】 11′ x 30″x 6″ Board could support riders up to 330 lbs.